Moist Yellow Cake with Buttercream Icing | Rosetta Bakes! I was recently asked if I would like to make a baby shower cake for a co-worker; and since I had recently made a Giant Red Velvet cupcake for a co-worker, I thought how cute it would be to have a giant cupcake surrounded by lots of little cupcakes. I decided I would make it a moist yellow cake with buttercream icing decorated with pastel baby colors, with pink being the highlight color since the arriving baby will be a baby girl! Preheat oven to 350 F. Grease and flour large cupcake pan, and use the rest of the batter for cupcake lined with cupcake papers, or if making a cake, grease and flour 3 (8′ pans). Cream butter till light and fluffy. Add sugar and continue to beat for 7 minutes, scraping bowl often. Add eggs, one at a time, beating well after each addition. Add flour and milk alternately to creamed mixture, beginning and ending with the flour. Add vanilla and the butter flavor just till mixed. You can bake the giant cupcake alongside the cupcakes, but the cupcakes will bake for 18 to 20 minutes, while the giant cupcake will bake for approx 45-55 minutes. I’ve not been baking giant cupcakes for that long, so the amount of baking time for the giant cupcake depends on the recipe. Check the giant cupcake after 20 minutes when you take the cupcake out of the oven. Wrap a wet towel around the base of the top part of the cupcake pan because it tends to brown faster than the bottom and continue to bake for an additional 25 to 35 minutes. Check top and bottom with a toothpick to make sure it’s done before removing from the oven. Baking time will vary according to recipe and oven. I double recipe so I’ll have plenty of icing for cupcakes. In a medium bowl, mix butter with sugar, 3 Tablespoons cream or milk and vanilla and cream until smooth and creamy. Sift meringue powder and confectioner sugar together and slowly add to creamed mixture and mix until light and fluffy. If you need to thin icing, add a little more milk. If you need to thicken icing, add a little more confectioner sugar. Once you have icing made, evenly divide icing into three separate bowls and tint with your favorite colors. I use Wilton gel to color icing, but you can you what you like. I used pastel pink, green and yellow. I iced the top of the cupcake with pink because the shower was for a baby girl. Filling three pastry bags fitted with your favorite tip and decorate! Use whatever candy sprinkles you like, have fun decorating. For the cupcakes I used green on the bottom, yellow in the middle and pink on top. When I filled my giant cupcake pan and cupcake liners, I layered my batter with the various colors. I put in green batter, then yellow batter and then the pink batter. 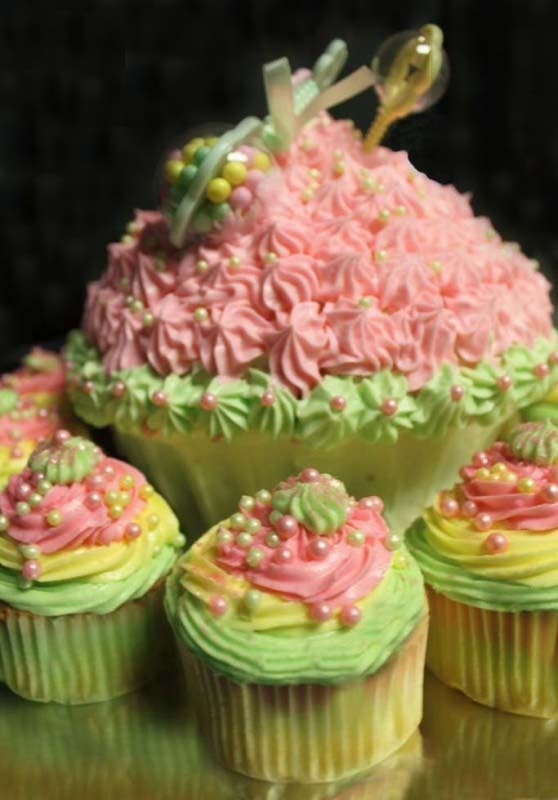 When you cut into the giant cupcake or peel off the paper of the small cupcakes, everyone will be surprised to see the rainbow colors of pastel green, yellow and pink inside!